While in New York this past weekend, I went to the oft-extended Alexander McQueen exhibit at the Met, Savage Beauty. I was impressed by the clothing and related accessories on display, having known almost nothing about the man before except the few "shocking" pieces that rose above the background noise of "who are you wearing" that surrounds big red-carpet affairs. 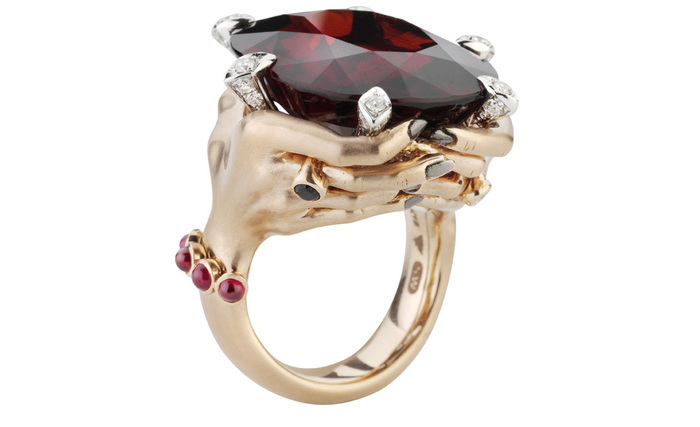 The pieces spanned his post-college work through the last collection he did, which as presented posthumously in the past year, and gave a good evolutionary progression. The early works show the clear influence of his prior work as a Saville Row tailor, not yet the insanity of the future, and the later pieces show the context of the great insanity that was commonly known. Alongside the clothing were some of the usual accessories, hats, shoes and jewelry, and some unusual bits, such as laser-cut wood wings and a cast-aluminum corset in the form of a spine and ribs. Where the exhibit really shown was in the displays and related settings. Each of the rooms had a theme, with the interiors decorated to match, and these were done quite excellently. Many of the pieces were shown alongside video of the original collection show, including a piece that was spray-painted by robots on stage and a series of chess themed works that played a game. All of the manikins were masked in some way to hide the blank heads, and even the masks were customized to the exhibit room's theme. The only drawback to the exhibition was that there was no clear progression, each room opened onto the next from the middle of a wall, so you could not simply follow the sense of the exhibit to see all the works, which led to weird traffic issues. There was also a wait to get in, about 30 min when we were there, but it was managed well enough not to be too annoying. 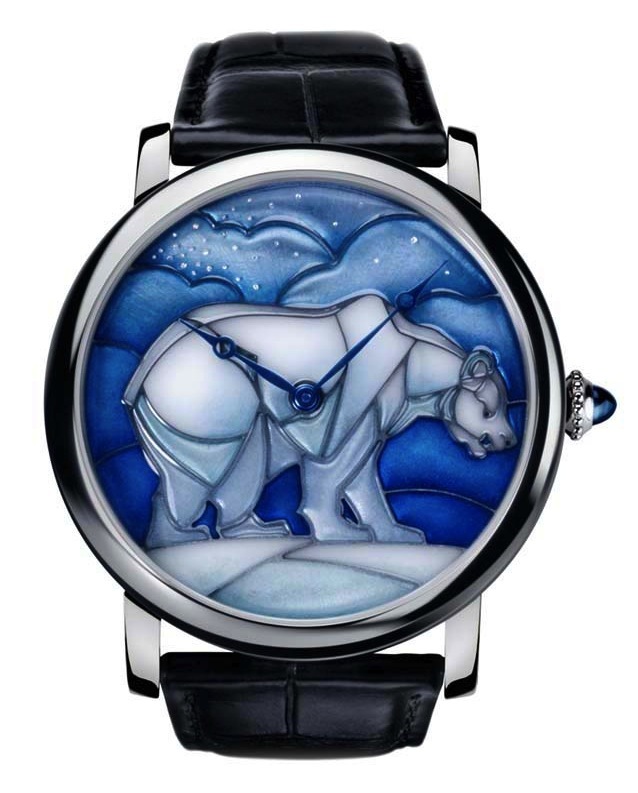 At SIHH 2011 Cartier(previously mentioned) released a version of their Rotonde de Cartier with a Plique-à-jour enamel dial of a polar bear. Plique-à-jour enamel filled in the spaces between thin wires, like cloisonne, but without a backing plate - the enamel is translucent like a miniature stained-glass window. 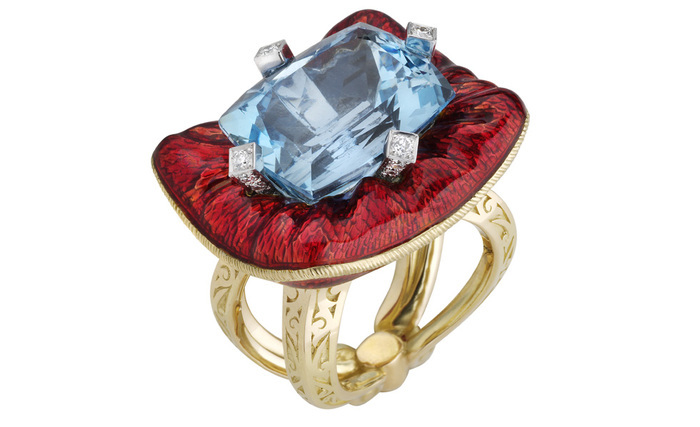 Like many other styles of enamel, it was quite popular during the Art Deco period, and has since fallen from fashion. They're not the original to the core of Christianity in the way they've become, only coming into play in the 5th century and appearing in their common form in the 6th, but the Seven Deadly Sins are firmly rooted in popular culture, from Dante's Inferno to the movie Seven. 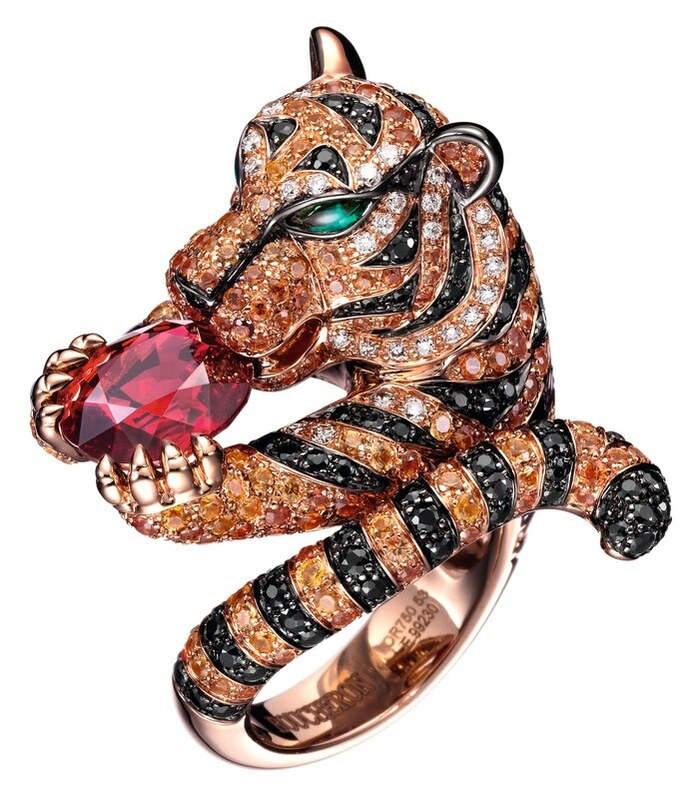 Stephen Webster(previously mentioned), who fancies himself something of a bad-boy when it comes to jewelry design, released a collection of rings on the theme late last year. 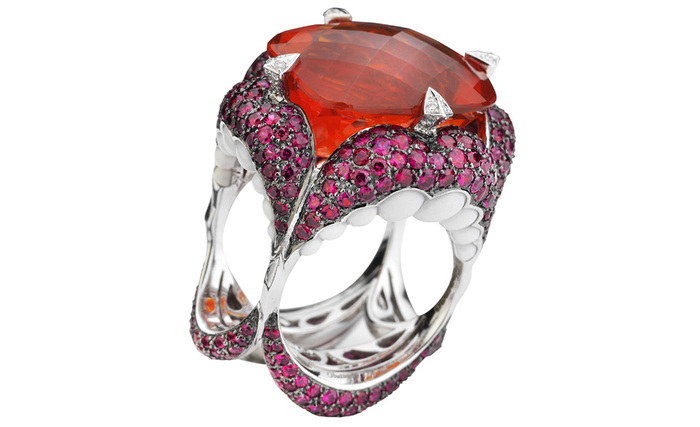 Though all the designs may not be to my taste, these are impeccably executed and show a cleverness of design that, for most of them, is not at the expense of function. I can think of many contemporary designers who could have taken these concepts and done them neither so artfully nor with such technical skill. 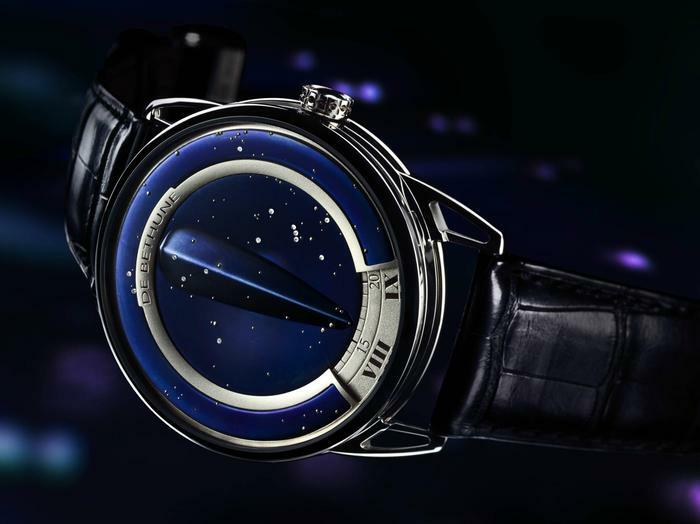 Another watch for the Only Watch 2011 auction (mentioned previously) is this special edition of the DeBethune DB25. In a 44mm white-gold case is a unusual 6-day manually wound movement(a variant of the DB2115 I believe) with a balance wheel made of silicon and platinum. The dial depicts what the sky is calculated to have looked like on January 8, 1297, when François Grimaldi captured the fortess of Monaco, site of the auction. The 105 stars of the constellations Gemini and Orion are represented by a combination of white gold dots and small diamonds. 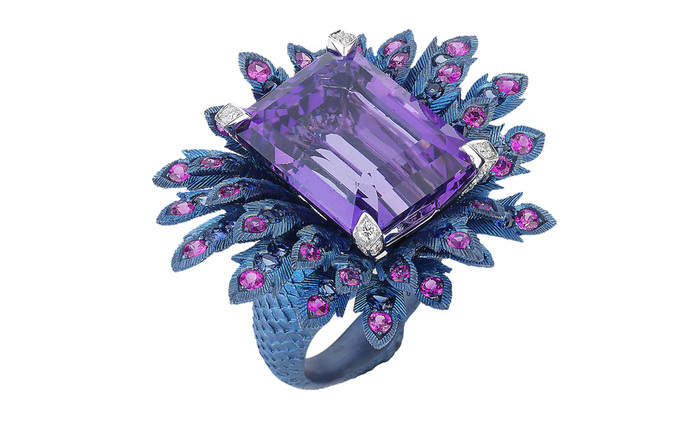 Though I don't particularly care that Boucheron (mentioned before) has opened a boutique in Beijing, I do wish to use that news to present the Bagha ring, from their Cabinet of Curiosities collection (mentioned before). 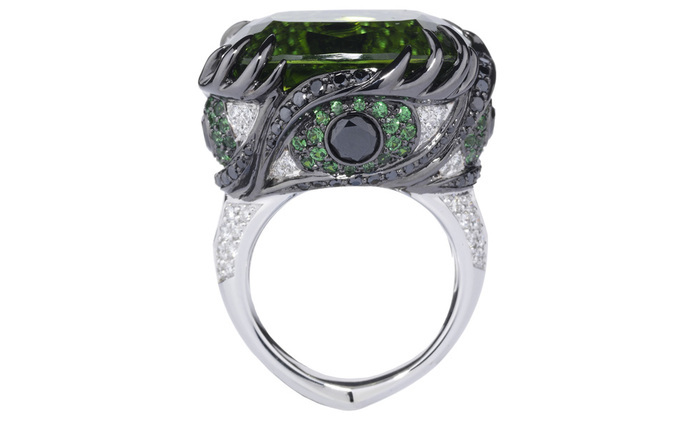 Constructed of rose gold and pavee set with black and yellow sapphires and white diamonds, it features cabochon emerald eyes and a large oval-cut red spinel center stone. 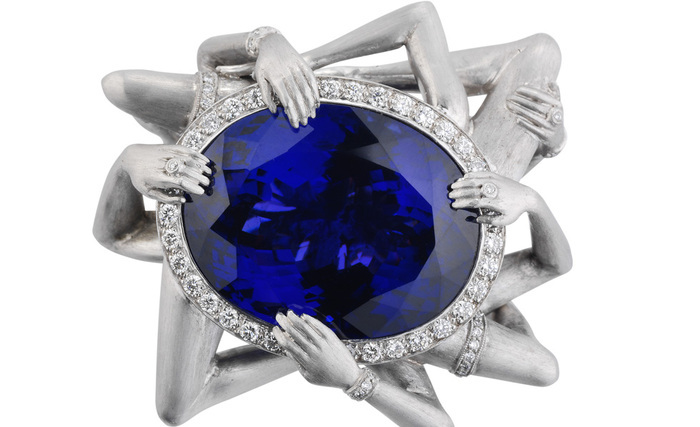 From Friday May 27 to Saturday July 16 the Goldsmith's Company of London has an exhibit of the work of a dozen modern silversmiths. Here are some of the pieces on display. 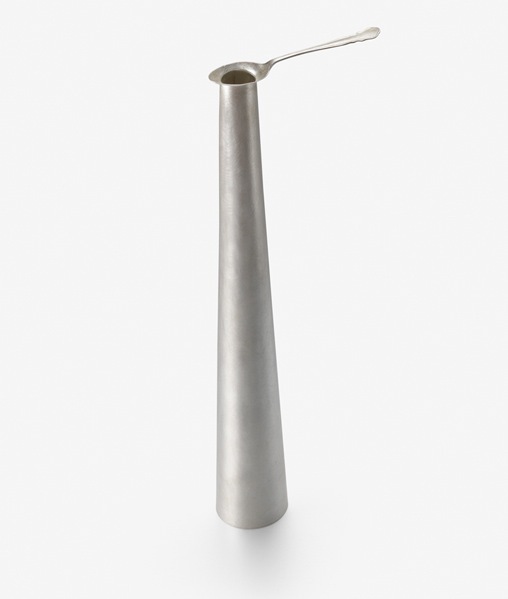 David Clark worked with an antique spoon and modern silver to create this "Deepest Deeperer spoon"
"Carafe and four Cups". by Grant McCaig 2010 Pleated Fine Silver, seamed and hand raised. 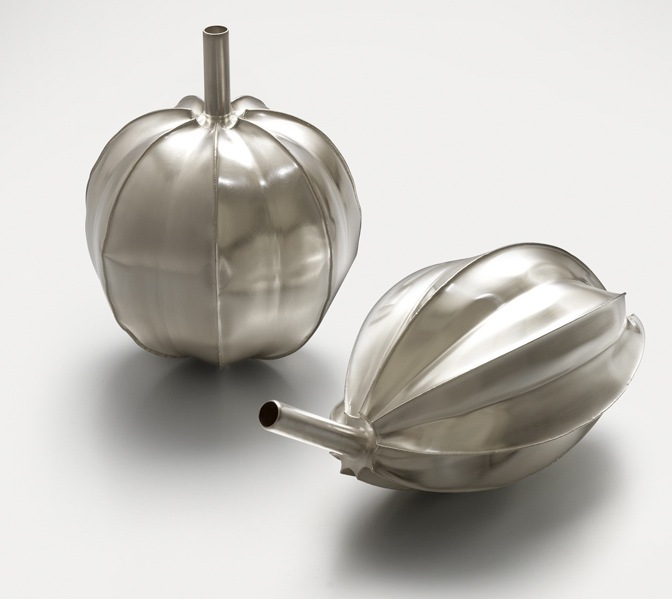 "Heptagonal Covered Jug" by Hector Miller, 2010 The lid is hinged and can fold down to form a handle for the jug. 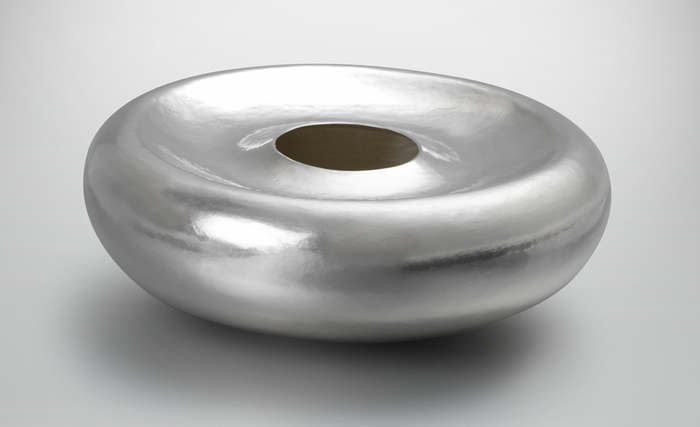 Sterling silver, formed, cast and fused construction with enamel by Frances Loyen. 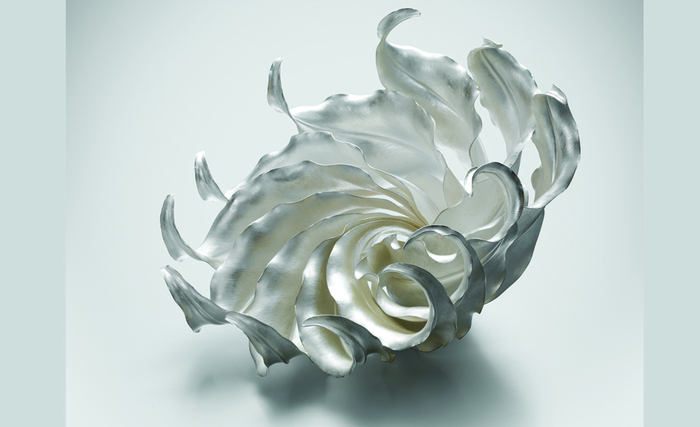 "Plunging Form" by Sarah Denny, 2010 Hand-raised from a single flat sheet of Britannia silver. 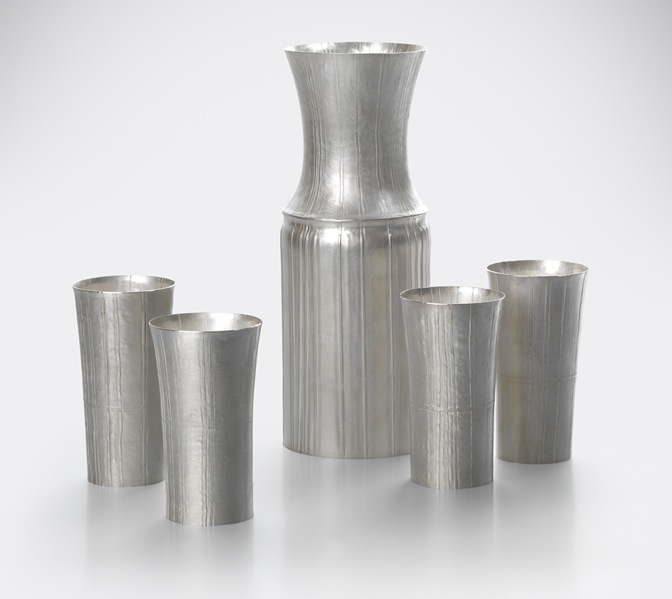 Britannia silver is a non-standard alloy of Sterling silver where the 7.5% non silver (usually copper) is reduced to 4.16%. 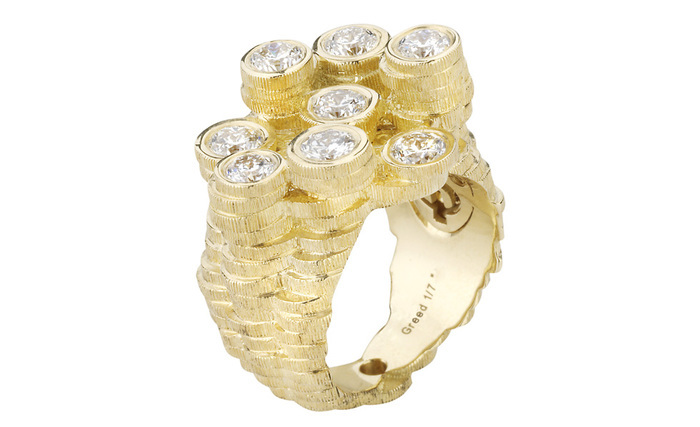 It was instituted during the reign of William III to try and stem the clipping of coins. 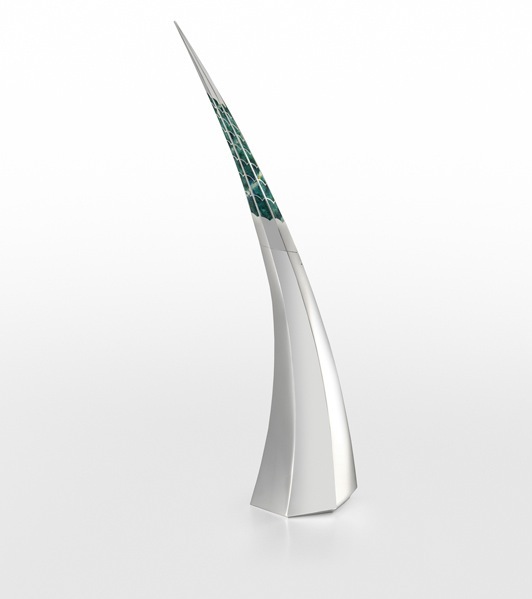 "Spiritus" by Theresa Nguyen, 2010 Fold-formed, hammered and soldered. 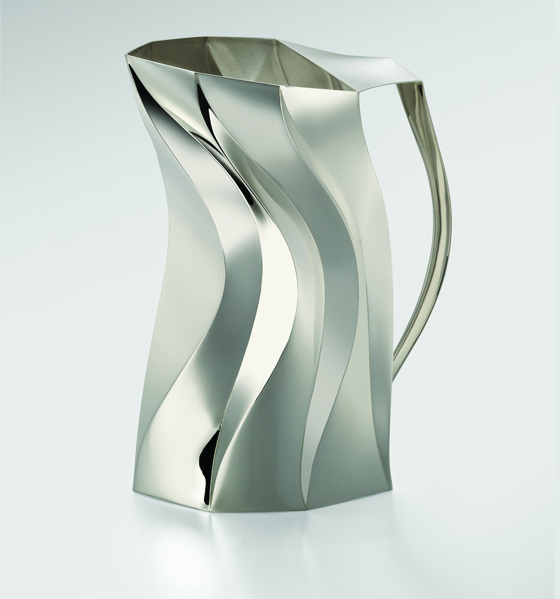 "Liner Jug" by Toby Russell, 2010 Sterling silver - scored and folded by hand from flat sheet. 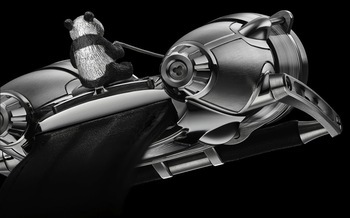 Summer is here, which means it is time for the watches for Only Watch 2011(previously mentioned) to start trickling out. 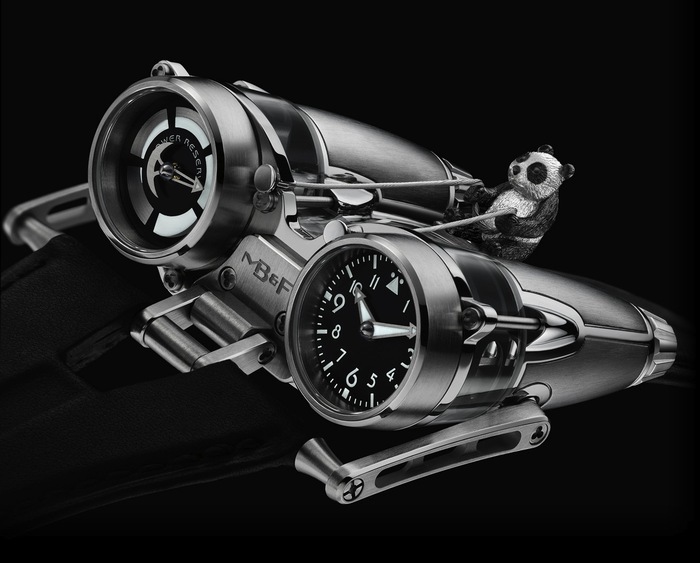 MB & F (previously mentioned) has set quite a high bar with their modified HM4 Thunderbolt. 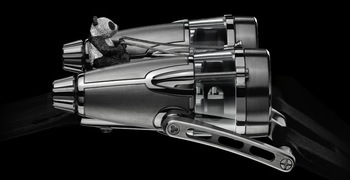 Working from an ink drawing, by Huang Hankang, of a Panda riding a rocket ship, they cast a little Panda from white gold and gave it a seat on the Thunderbolt. 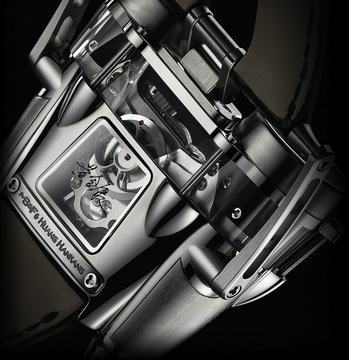 He controls the machine with reins woven also from 18k gold and Huang's signature is etched into the bottom sapphire crystal, one of 5 on the titanium watch case. 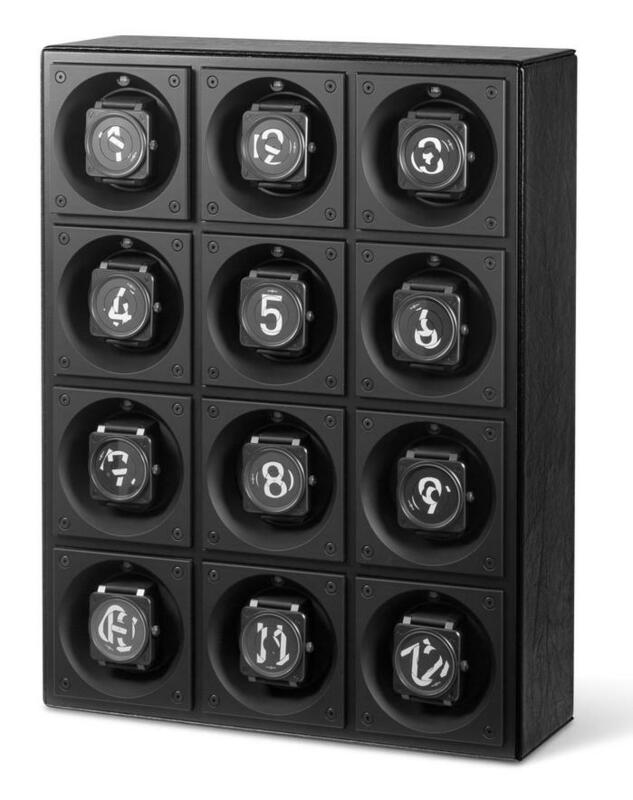 No, not the new term for a group of watches, that is a 'confusion', this is a clock, which indicates the current time, only apparently to the nearest hour, build out of 12 watches. 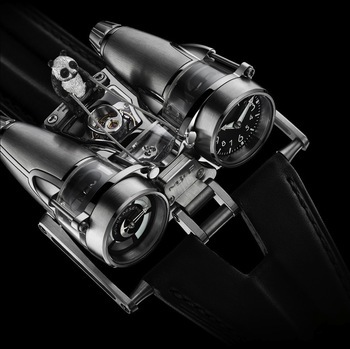 Bell and Ross took 12 automatic watches and designed the sections of the dial to indicate a number between 1 and 12, when all the sections line up. Then they skewed the watches so they line up at that hour. Finally all the watches are installed into a custom winder mechanism, so you don't have to take each one out and wind it. 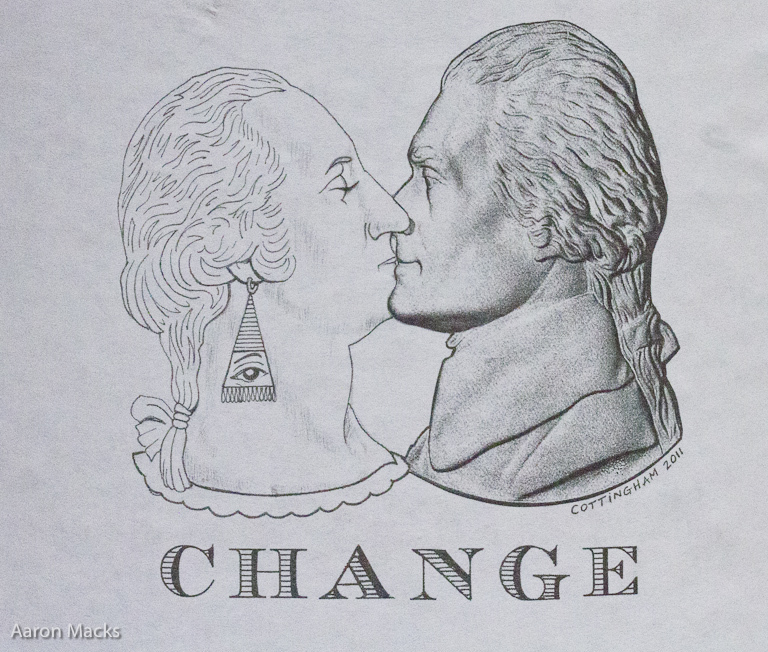 I think it is one of the more interesting things B&R have done, but that is more of an indictment of their usual work.